UPTON, NY — Smithtown High School West student Peter Ren won the first-place prize of $500 in the annual Science and Society Essay Contest sponsored by the U.S. Department of Energy’s Brookhaven National Laboratory. Forty-four students from seven Suffolk County schools entered the contest. 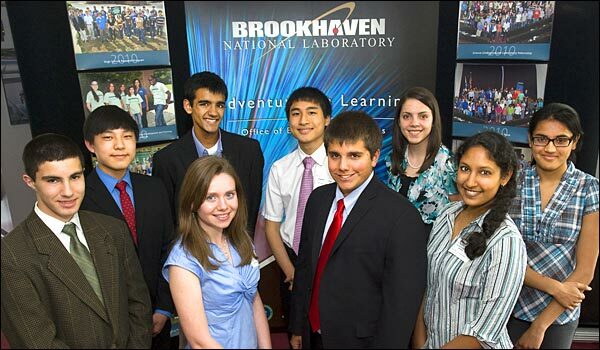 The winners of Brookhaven Lab’s 2011 Science and Society Essay Contest are: (from left, front row) Nicholas Spiezio, Alexandra McHale, and Adam Kirdly, all of Smithtown High School East; and Gouri Sadananda, W.T. Clarke High School; (from left, back row) Daniel Wang, third-place winner from W.T. Clarke; Sanjay Palat, second-place winner from Smithtown High School East; Peter Ren, first-place winner from Smithtown High School West; Taylor Medwig, Smithtown High School East; and Neema Patel, Smithtown High School West. Sanjay Palat from Smithtown High School East won the second prize of $300, and Daniel Wang from W.T. Clarke High School won $200 for his third-place essay. Honorable mention prizes of $50 each were given to: Adam Kirdly, Alexandra McHale, Taylor Medwig, and Nicholas Spiezio of Smithtown East; Neema Patel of Smithtown West, and Gouri Sadananda of W.T. Clarke High School. The Science and Society Essay Contest challenges students to think and write about the purposes and social implications of scientific research. This year, students were asked to write about a timely issue — addressing the risks of nuclear proliferation. Students were asked how they thought the threat of nuclear proliferation could be managed at a time when global climate change may lead to increased growth in nuclear energy. They were given the task of discussing the role of the International Atomic Energy Agency and Brookhaven Lab in preventing proliferation and how science and technology might be used to affect future nonproliferation policy decisions in the U.S. The Laboratory’s Office of Educational Programs runs the essay contest, and Brookhaven Science Associates, the company that manages the Laboratory for the U.S. Department of Energy, sponsored the contest prizes. Contest judges included nonproliferation experts and a public affairs representative, all from Brookhaven Lab; and a retired teacher from the Shoreham-Wading River Central School District. Friends of Brookhaven, an employee organization, started the contest 12 years ago. Brookhaven Lab’s Nonproliferation and National Security Department (NNSD) worked with the Office of Educational Programs to develop the essay questions, and NNSD Deputy Chair Susan Pepper gave a brief presentation to the winning students, parents, and teachers about the Laboratory’s work to prevent nuclear proliferation. The NNSD conducts research for the Department of Energy and other government agencies to safeguard nuclear materials and prevent the proliferation of nuclear, chemical and biological weapons in the U.S. and throughout the world. These efforts extend to arms control verification and technical support. Also, the department develops technology for counter-terrorism; critical infrastructure protection, especially advanced detectors and radiological protection; and provides training for others in these areas.